Government officials in Sweden and Hungary are considering innovation development as one of the breakout points for the European economies and are working closely together to establish R&D strategies. Innovation activities provide companies with new business opportunities and promote employment prospects as well as the reduction of social inequalities. Special attention is paid to education, startups growth with substantial R&D activities, and the establishment of a legal environment to support innovation. The Embassy of Sweden together with the Business Sweden Council organized the World Café, held in Budapest, on June 11. The event gathered Swedish and Hungarian experts and decision makers from the private sector to discuss innovation and R&D development in Hungary. 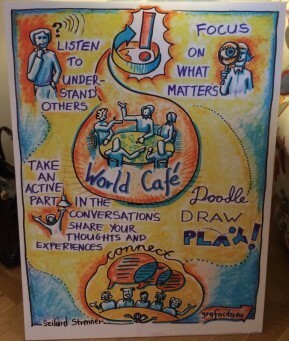 The World Café concept enables free discussions, and creates confidence and an informal atmosphere. Representatives of the Embassy of Sweden and leading Swedish companies operating on the Hungarian market – Sigma Technology, Ericsson, Electrolux – were the event`s guests. The participants shared what innovation meant for each of them and generated ideas on how to create an inspiring innovative environment. They also stressed the vital role of education in this process.